When someone offers you a ride in a private helicopter, how does the story not end in a fiery crash? It seems like too perfect a set up. Too much foreshadowing, knowing that the ride was going to happen, and telling friends and family about it, it just seems like the odds are extremely tipped in the direction of fiery crash. What a great anecdote to be able to tell your friends though, how you knew someone who went down in a helicopter. “That happened to someone I knew one time,” you’d be able to tell people at parties, the same way I can truthfully say that I know that people get hit by buses all the time. I know, anecdotally, both someone who was hit by a bus, and someone who hit someone with a bus. “It happens every day,” I can say with just a slight air of authority. So how could riding in a helicopter, particularly a private helicopter be any different? There was a certain comfort in knowing that it would likely all end careening into the deceptively fluffy looking fields which envelop the Gorge in an endlessly rolling cross-hatched quilt. Perhaps the landing skids would get tangled in the web of delicate high voltage power lines and cause us to plummet into the mighty Columbia river. I had been preparing mentally for this eventuality, making sure the cat had plenty to eat just in case I didn’t make the return trip and she had to wait for someone to find her and take her to a new home. You never know. And just how does it feel to collide with the earth from 500 feet? On the few occasions that I have been seriously injured, it seems like shock takes over and gets you through the worst parts. Is it just over? One minute you’re tracking your rapid descent, the next you’re not? Does it all go black? When sleeping, rarely, if ever, does it feel like time hasn’t passed. There isn’t usually a complete blackout where one moment it’s night, then in a blink, the next morning snaps into existence. I have always felt an awareness that time is passing; sometimes peppered by dreams, sometimes not. When morning comes, it is rarely a surprise. With a crash though, or a fall, people are killed instantly, or so they say, but are they really? I am guessing if it is indeed fast enough, things get shut off without much pain. And how about drowning? If a helicopter were to fall into a body of water, the impact might be jarring enough to do some damage, but if that weren’t sufficient there would be water everywhere to contend with. Water in lungs is pretty unpleasant, I discovered the one and only time I ever tried water skiing. When you’re being by a boat pulled, should you happen to fall,they tell you to just let go of the tow rope. Just let go! “Sounds simple enough! I am going to ace this right out of the gate,” I tell myself, envisioning all the admiration I’ll get from the cool kids gathered around me at the dock afterward, noting my extreme prowess and aptitude as a first time skier. I barely had time to notice that the boat had shot off; the line immediately became taught. Rather than keeping my legs stiff and assuming the proper and graceful skiing pose, I fell face forward into the frothy wake, and was pulled for several meters, inhaling what seemed like several gallons of lake water in the process. The next few minutes were spent sputtering and coughing, trying to simultaneously expel all of the liquid in my lungs, and somehow maintain a shred of dignity and cool. This was made all the more difficult knowing that the boat was filled with a group of painfully attractive and infinitely more coordinated guys whose party I had infiltrated, and who had all witnessed my entire graceless ordeal transpire. The wet-suit I had stuffed myself into served as a flotation device, and allowed me to keep my head above water as a sputtered and choked in a semi-panic. I was able to catch my breath and flop back aboard the boat, and miraculously managed to maintain just enough composure to pose for a reasonably collected photo as I clambered to safety. If one is fully submerged underwater, and sputtering and coughing only lead to more water in the lungs, eventually the oxygen just runs out. I don’t doubt this is unpleasant, although it probably doesn’t last much longer than a couple of minutes. But then what? Well it turns out that if you’re in the hands of a skilled and experienced pilot, who performs a meticulous pre-flight check and has logged over 1,500 hours in the air, the journey does not end up fiery at all and you don’t get to experience what it’s like to crash in a helicopter. In my life I have been inside a pretty long list of transportation formats; cars and trucks and monorails and subways and elevators and moving sidewalks; airplanes and boats and ships and even a submarine; zip-lines and ski-lifts and cable cars and tramways and a space capsule. It seems likeI remember being inside a tank at some point, and I know I sat in the cab of Bigfoot, the Monster truck when I was a child. But not a helicopter. Although I don’t have a fear of flying, I know I don’t like heights much. A fact I accidentally discovered after scaling the Astoria Column in Astoria, Oregon. I effortlessly bounded up the 164 steps to the observation deck, only to find my body inexplicably paralyzed once I reached the top. My body clung to the wall of the column with every available square inch of flesh, and I was puzzled by the fact that in spite of my insistence to my legs that it was safe, my feet remained firmly planted. It took several minutes before I was able to pry myself away from the wall and coax my feet to walk back down the stairs. At work, my office mate told me that she had been an intern for one of the local news stations and had ridden in the weathercopter several times. She mentioned that unlike an airplane where there is a lot of anticipation of the takeoff, and rapid and taxing acceleration as you leave the ground, a helicopter just kind of lifts off the ground and you’re flying. Despite my almost certain impending doom, I was not at all anxious at any point during the flight. The flying part was not that different from being a passenger in an airplane. You’re high above the ground, and moving around quickly; things pass by the windows and it just looks kind of like they do out of a car or train window. It might have been different had I been sitting in the front seat with the pilot, but strapped in the rear seat felt fairly safe and somewhat familiar. The difference is felt when the rotor kind of tilts to the side and suddenly it becomes more apparent that the cockpit is being suspended by something above. It was fairly windy, but apparently it doesn’t make too much difference to the helicopter, which generates a fair amount of wind itself. As the craft cruises above the hills, it feels like the helicopter’s elevation should rise and fall according to the contours of the landscape. It was always a little surprising that we didn’t start to plunge downward with the cliff, but rather we floated effortlessly in a straight line through the air regardless of the distance below. There was some turbulence, and a kind of twisting sensation which I couldn’t help thinking was the tail rotor struggling to counteract the massive blades above. After soaring over several acres of farmland and desert, our pilot thought it might be fun to touch down someplace that humans can’t readily go, so we landed on a steep island plateau in the middle of the Columbia River. As we stepped foot on the island turf, there was something utterly alien about the landscape. The vegetation was extremely dry and lifeless, but also unknown. A strong hot wind whistled through the yellowy grasses transposed against the rocky brown canyons and blue-grey sky, it was the embodiment of one of my favorite color palettes. 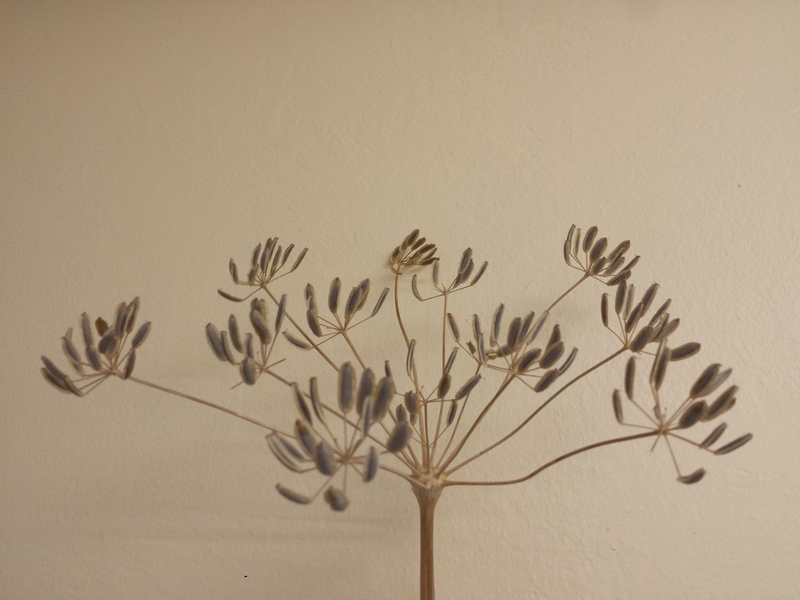 I was drawn to a particularly intricate plant specimen which resembled fennel seed, but didn’t have the same distinctive scent. It was richer, more like celery or caraway, and lingered in the air. The sun poked through the clouds long enough to bathe the island in a magically golden hue for a few short moments before shifting ominously as huge dark clouds rolled in from the south. A low rumble of thunder echoed throughout the Gorge. Although I didn’t see any lightning, I was reminded about the old advice that one should never be the tallest object in an open field when the air starts to tingle, lest lightning strike you down for hubris. We headed back to the safety of the cockpit. There was an urgency to the excursion that reminded me of the planetary explorations in movie “Interstellar,” as though each minute we spent on the island was costing us hours of precious time back in the real world. We cruised around for a bit longer, circling around the Mary Hill Museum and Stonehenge Memorial in Goldendale. It occurred to me that we didn’t seem to need any sort of permission or authorization to tool around wherever we wanted. I would have thought that there would be some sort of restrictions on buzzing public gathering places at close range, but surprisingly not. I was told that it’s about elevation, and the FFA only seems to care if you go a exceed some certain height. We were operating below the radar which is apparently the correct use of that expression. Any rich weirdo with a helicopter can ostensibly zoom around unrestricted whenever they like which seems incredible. On the other hand, I don’t often see helicopters in public settings taking advantage of this fact, so either there are very few personal helicopters in the world, or the regulations aren’t quite as lax as we were led to believe. At this point it began to seem like we were never going to crash, and indeed, our pilot set course back to the airport. I realized my first helicopter ride would soon be coming to a close, and it seemed pretty apparent that all of the photos that I took before and during take off to help the salvage crews identify the craft and our charred bodies were probably just going to end up making a kind of cool, albeit slightly panicked photo album. In the last few moments before we started our final descent, I glanced west and noticed that the sun was struggling to paint a memorable sunset. I was slightly annoyed that it didn’t quite achieve the true magnificence through the clouds and haze befitting the uncommon view from a helicopter, but nothing is ever exactly perfect. We touched down lightly in front of the hanger and wheeled the helicopter back into its little house. The show was over. As the enormous hangar door closed, I realized that I hadn’t really planned the next move. There was a part of me that believed, perhaps even hoped, that we would not survive the journey. It would have made such a clean and unusual act break. Great. What do we do now? My father hopped in my car and I drove us into town in a post-flight afterglow. It was getting dark, but it was still hot so we opened the sunroof and all the windows and let the wind in to blast our faces and tousle our hair. And so I blog. New challenges and adventures would appear to be in store, and as they occur, as I feel the need, I will record them here. Well written. I enjoyed your flight. If I had known you were expecting to crash I could have faked an emergency and you would have at least had the first part of a crash. Next time, I guess.